Peanut butter, peanut butter, PEANUT BUTTERRRR!!!! I’m sorry for my little outburst. I just really, really, like love peanut butter. 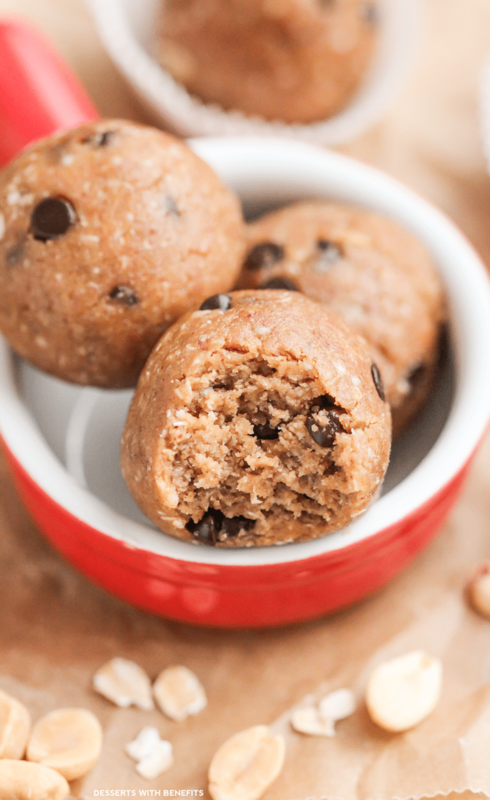 So I made these Healthy Chocolate Chip Peanut Butter Cookie Dough Energy Bites! When I was a kid, I used to buy a ton of those pre-made cookie dough tubes from the grocery store. About half of the time, I bought cookie dough just to eat it straight up, and the other half, to actually bake cookies. What really ended up happening was me sitting on the couch eating the dough raw… that shizz never made it to the oven. I don’t know what it is about cookie dough, it’s just so freaking addicting. 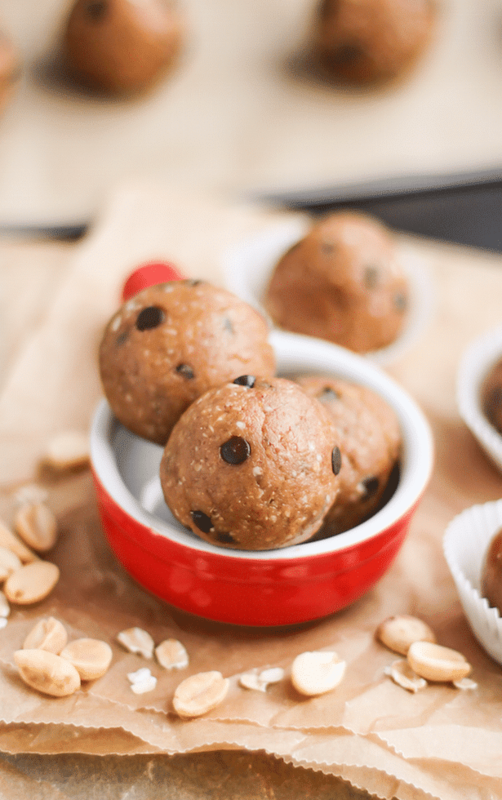 These chocolate-studded, no-bake Peanut Butter Cookie Dough Energy Bites are sweet, rich and UBER peanut buttery. You’d never know they’re low sugar, gluten free, dairy free and vegan! 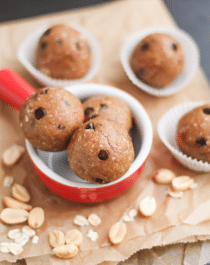 These chocolate-studded, no-bake Peanut Butter Cookie Dough Energy Bites are sweet, rich and UBER peanut buttery. You'd never know they're low sugar, gluten free, dairy free and vegan! 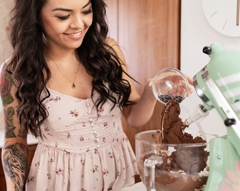 In a stand mixer with beater attachment, add the peanut butter, almond milk, stevia extract, vanilla extract, cinnamon and salt. Mix on low speed until fully incorporated. Add the quinoa flakes, mix, then add the oats, mix, and then add the chocolate chips. Mix until everything is even. Scrape down the sides of the bowl if necessary. 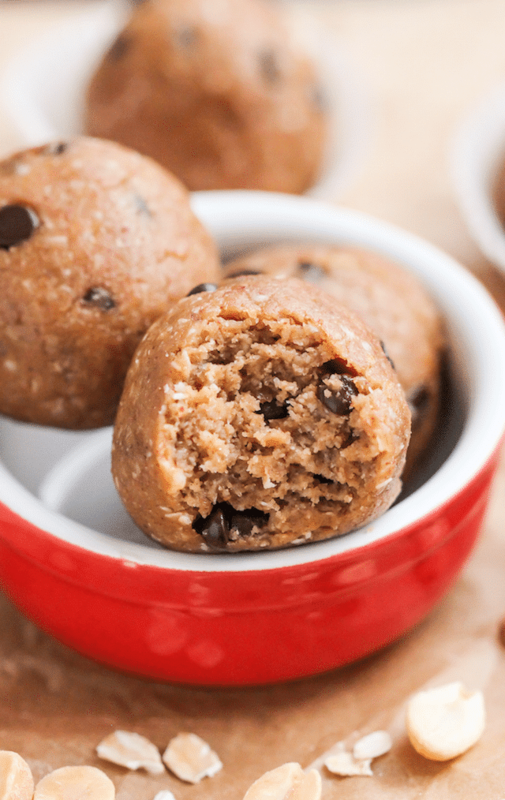 Use a cookie scoop to portion out the dough and roll the dough into balls. Place the balls onto the pan, then refrigerate uncovered for 30 minutes. Serve immediately or store in a tightly sealed container in the fridge. **My peanut butter was quite dry (it was the last bit out of the jar where I didn't mix in the oil that had separated well enough). So I needed to use ¾ cup of almond milk. I would recommend starting out with ½ cup, then add more milk if the dough needs it. If you don't have Quinoa Flakes, you can try using all Quick Cooking Oats, but I haven't tried it. Most energy bite recipes are bound together with dates or some other dried fruit, but I wanted to make these sugar free. 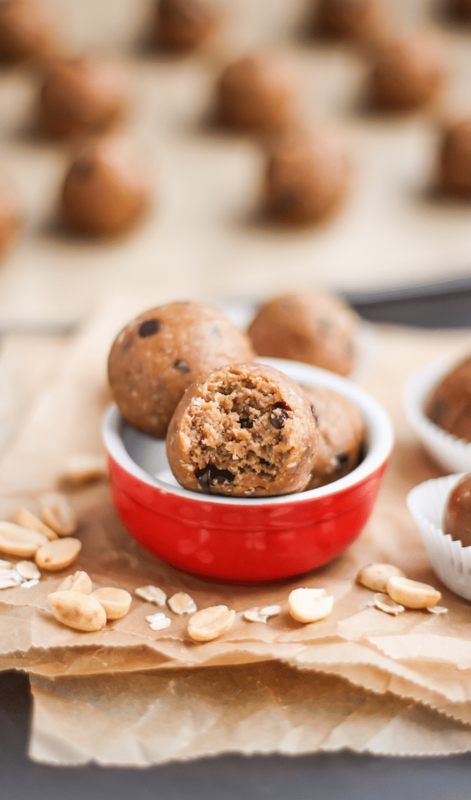 These Healthy Chocolate Chip Peanut Butter Cookie Dough Energy Bites are super easy to make. Behold the fudginess. Just sit back, take it all in, and fall in love. Oh my goodness! 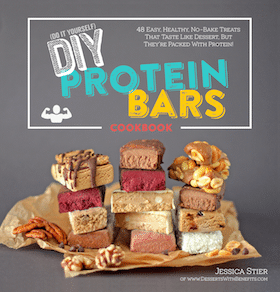 Those chocolate chip peanut butter bites look amazing. 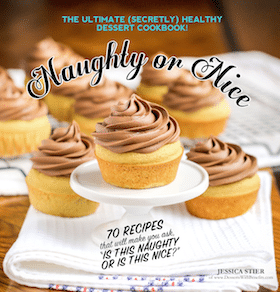 I am always looking for a good recipe, especially one that tastes good and is healthy. I can’t wait to make those very soon. These sound & look awesome! But I don’t have quinoa flakes and don’t have any other use for them other than this recipe. Do you have any replacement suggestions? Thanks Breanne! You can replace the quinoa flakes with quick cooking oats. However, since quinoa flakes are much thinner (they’re like confetti), you probably won’t need to use as much oats… I’d say 3/4 cup oats. These look and sound amazing!! I can’t wait to make them, I just don’t like the taste of stevia or any artificial sugars, is there anything else I could use? I haven’t tried using anything in place of the stevia so I can’t be sure. The only substitute I can think of that might work would be Truvia. Liquid sweeteners like honey or maple syrup wouldn’t work because they would throw off the dry:wet ratio, and it would be like “energy sludge.” Sorry!